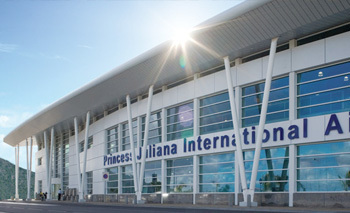 (October 24, 2013) - Copa airlines, the island’s major connection to the South American market, will be back to servicing Princess Juliana International Airport (SXM) with four flights weekly from its Panama hub as from December 12, 2013. This was one of the results of talks held between a delegation led by the Hon. Thadeus Richardson, St. Maarten’s Minister of Tourism, Economic Affairs, Transport and Telecommunications (TEATT), and Copa executives in Panama recently. However, for the Copa flights to remain sustainable, it was agreed that the St. Maarten delegation, which also included representatives from the Office du Tourisme in Marigot and Anguilla, would create market awareness to help push the flights. Similarly, it is imperative for St. Maarten to revisit its VISA requirements if an increase in traffic is the desired goal as the current requirements do not favor tourism growth. “Furthermore, we would have to optimize our product, as everybody sells a different type of product, and focus on secondary markets such as Porto Alegre rather than Sao Paolo and Rio de Janeiro in Brazil,” reported Suzy Kartokromo, Acting Manager, Marketing and Customer Service Department at SXM, who was part of the delegation. Partnering with Copa Airlines currently are both halves of the island and Anguilla. In keeping with the objectives of the recently concluded Air Service Maintenance and Development study, efforts are ongoing to include hub partners St. Barths and possibly both Dominica and Tortola in the marketing efforts. Copa Airlines operates a network consisting of 66 destinations in 29 countries, which represents 1,800 weekly flights using 90 aircrafts that are on average only five years old. Copa’s average load factor is in the high 80%, and occasionally surpasses 90%. While 250 strategic partners sell Copa Vacations packages, the airline also offers a great marketing tool dubbed the “free stopover in Panama” for connecting passengers. This is a 2 for the price of 1 deal that allows travelers NOT originating in Panama to stay up to 7 days at the connecting city (Panama) on their way to or from their destination. Minister Richardson extended an invitation to all parties to hold the next meeting of the group in St. Maarten. No date has been fixed for this meeting yet.